With the Faber® iNsert™, you now have the option of replacing the tone robbing pot metal inserts in your Nashville bridge equipped guitar with the highest quality, tone enhancing German steel inserts on the market today. This system, with 4mm upper threaded posts, is reversible and requires no modification to your guitar, and will allow you to use either the Faber® ABR-1 style ABRN/ABRM bridges, or our revolutionary ABRL Tone-Lock™ bridge. 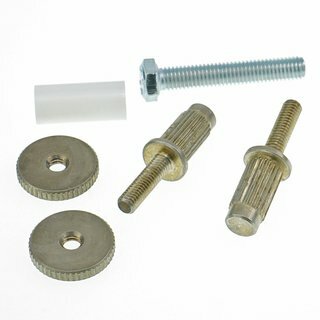 Includes one pair of STEEL studs and thumbwheels (gloss or aged nickel, gloss or aged gold) and a hard plastic installation tool and a 5mm bolt to remove the old Nashville bridge inserts. For even more tone enhancement, consider the Faber® HYBRIDge™, with it’s unique combination of titanium and natural brass saddles, in either ABR-H, -M, -N or ABR-L Tone-Lock models. NOTE: The depths of the original insert holes are not consistent! Please measure the depth and insure that the holes are deep enough so that the iNsert will install flush with the guitar body.